NBA-Caliber Jumping Spiders Spotted In U.K. The Sibianor larae is a part of the Salticidae family. There are apparently 6,030 species of Salticidae on Earth. This accounts for 13 percent of all spiders, making it the largest family out of all of the arachnids. Although undiscovered until 2001, jumping spiders can be found all over the Earth’s Palearctic realm, which spans Europe to Russia to the Mediterranean. There are over 50 species of jumping spider in the United States and Mexico. Seventy-two species were spotted in Africa. Looking at the Sibianor genus in particular, the Sibianor victoriae can be found in Kenya and the Sibianor annae can be found in China. Over 35,000 species of spider are poisonous, but no reports of this particular spider show reasons to run away upon encountering them. 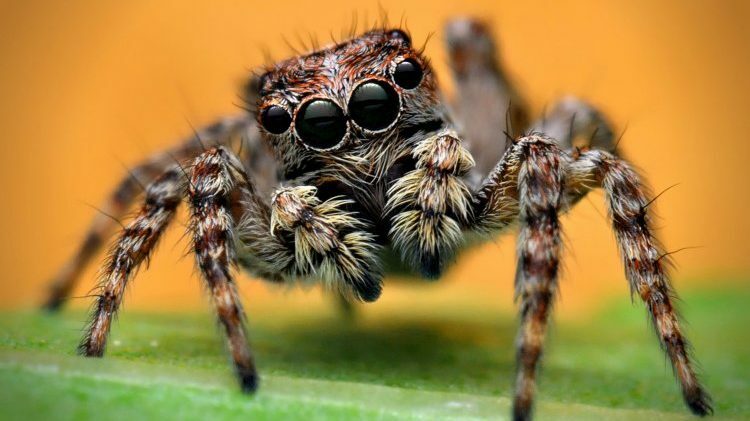 With four pairs of eyes, jumping spiders have some of the best vision found in arachnids. The deadly combo of excellent eyesight and jumping ability make this the Spider-Man of arachnids. Maybe this was the type of radioactive spider that bit Peter Parker. England’s summer this year went from hot to rainy. Given that the Sibianor larae jumping spiders love swamps, moisture, and bog-like conditions, it could mean that jumping spiders that can reach 6 feet are on their way to populating homes all over the U.K.
With the average human height measuring under 6 feet, most people are not immune to being startled by jumping spiders. Those who are 6 feet or taller could be at the right height to get a jumping spider in their ear, mouth, or neck. The jumping spider has only been known of for 17 years. What other beasts might be lurking in Earth’s bogs? If these guys, or any other eight-legged bros crawl into your home, it’s still best to let them go. However terrifying they might be, they’re been creepy-crawling around Earth for longer than we humans have. Spiders will continue to spin their webs even after humans destroy themselves. They’ve gone all this time without taking over mankind, so we ought to afford them some respect, no matter how creepy they are.